For this January 2019 Ssshhhh secretly cooking, we are making dish from Manipur. I had manipuri classmates during my undergraduation . I had tasted the store bought snacks which my Manipuri friends bring after the summer vacation like salted sunflower seeds and mango candy . Other than that i heard of them eating a lot of dry fish. I was paired with Sujata Roy of . She gave me Cardamom and bay leaf as my secret ingredients. 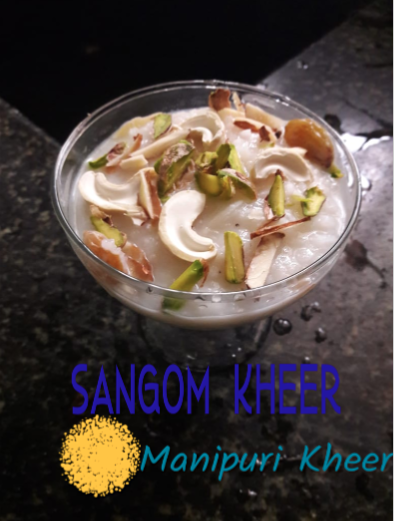 I decided to make this delicious kheer Sangom Kheer. In Manipuri , sangom means Milk and Kheer generally means Indian Style Pudding. Though , the milk kheer is made commonly around every state of India , I find adding bay leafs , edible camphor makes this kheer different from other counterparts. I followed the recipe from here pusphita's chakhum. Wash and soak rice for 30 minute. Boil the milk in a thick bottomed pan. Then let the milk simmer with the Bay leaf and cardamom till it reduces to 3/4 th of its original volume. Add the soaked rice into the milk and cook on slow flame with stirring in between . When the rice grains are boiled , add the sugar and milk powder and mix well. Add the cashew , raisins , edible camphor , grated coconut and ghee , mix well and take off flame. Let the kheer cool down. Serve the kheer with silvers of almond and pistachios as toppings. If the kheer is very thick after cooling you can add boiled milk to get the desired consistency. The Kheer looks and sounds delicious. Perfect dessert treat for the family! The kheer looks so thick, creamy and delicious. The preparation looks so similar to payasam we make except for the addition of bay leaf and edible camphor.